At Kalvos & Damian, we have been broadcasting for nearly ten years from a beautiful, valuable, endangered place -- a hybrid community-college radio station. Its license is college-owned, its programming and funding contributed by the community and college. There are few of these stations left in the United States. For those whose experience is exclusively radio-as-digestive-aid (whether corporatized Clear Channel or NPR or government stations), this might have no meaning. But Kalvos & Damian's New Music Bazaar would never have existed save for community radio. Our show didn't come from a high-value production source. It didn't come from People With Names. It came from the community--two local composers filling an empty local time slot at the suggestion of a local performer made to the local station manager. Just try that at your nearest radio station. If it's commercial, it just won't happen--it'll be formatted as news or pop or country, and that will be that. If it's college, it'll be dominated by pop or pseudo-underground music -- it'll be just as formatted and girded by the college's 'educational' needs, and that will be that. If it's so-called public radio, it will be dominated by a in crowd -- a terrified management will be playing Jazz Lite or Klassical Klearinghouse with a news department that's shaking at its knees, and that will be that. If you're outside the U.S., it will be regulated and red-taped--the extant stations will laugh at the idea of an independent running on small change, and that will be that. Here in America, as frequencies get more and more valuable, monopolies more and more wealthy, and the Federal Communications Commission more and more reactionary, community radio is being swallowed. And, sadly, the community itself is being trained away from open discussion, critical commentary of the corporatized society or value-toxified government. Community radio is anomalous and frightening in this rigid broadcast atmosphere. Even our own community, though rich with doctors and lawyers and high-tech professionals, barely has ears turned toward the sounds of this station, if fundraising is any guide. Those who listen are dedicated and even visionary. So K&D fits among misfits, where radio explores boundaries, and where listening is not background, but foreground -- albeit optional. So optional that when introducing ourselves at a WGDR programmers' dinner a few nights ago, we said "If your radio's turned off -- that's our show!" And so on December 16, 2004, something incomprehensible happened in the days of radio-as-digestive-aid, when alternative radio is defined by Garrison Keillor or Rush Limbaugh. 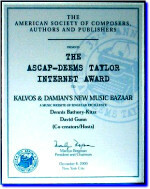 Kalvos & Damian's New Music Bazaar won WGDR's "Excellence in Broadcasting" Award. Imagine that. We caused no end of trouble for WGDR, including copyright issues during the genesis of the Digital Millennium Copyright Act, lawsuits threatened by a disaffected minor composer, demands on the college web server back in the early days before kalvos.org arrived, setting up a website for an unsanctioned community radio group, doing an air/net simulcast from Europe, overloading the performance studio with projects for live on-the-air concerts, skirting the edge of FCC prudishness -- and on and on. Yes, we were among their larger fundraisers over the years, plus we've received some good publicity worldwide. We're also one of the oldest shows on this community station (old enough to retire), taking ourselves just seriously enough to worry about our sound, our content, and our themes. No, we never intended anything more than 13 weeks of fill-in one sweet summer in 1995, when the Golden Age of new music was not yet ascendant. This essay is also about Stu Bautz, who as a station manager was an artist of imagination and commitment, and Carlos Haase, who struggled mightily but without praise to hold the station together through its worst crisis in two decades, and especially Amanda Gustafson, whose hard line merged with gentle soul to build an environment of calm and steadiness, and Bert Klunder, a sound engineer with a sculptor's touch, and the volunteers and the changing staff. This essay is also about programmers who, though they rarely understand each others' choices and motivations, listen with respect and even call in as cheerleaders from time to time. The poetic and the politic and the motivic and the psychotic live in the mix, streaming out along a narrow frequency band. What might the Martians think? More important, what might you think, dear reader? Will you click away from this page? Or will you seek out your local community station -- even WGDR, if you're reading from central Vermont -- and support it with cacaophonous voice, clear virtue and cash value? There's little time left in America for the endangered species that is community radio. You'll need to be your own airvironmental protection agent. And to WGDR, Kalvos & Damian's thanks for being considered excellent in broadcasting.